There are literally dozens of different accessories that an archer can chose from to enhance their experience, ranging from classic additions like arm guards and targets to more historic choices like reenactment apparel to complete your look as a medieval archer. 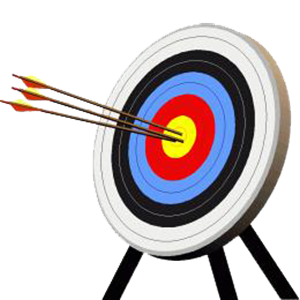 And Medieval Archery has all that and more, displayed for your browsing right here in our selection of archery accessories. With so many items in this section, there are a lot of different directions that you could go with, in regards to historic archery. No matter what direction you take, arm guards and gloves help to prevent bow string slap and provide you with much needed protection, while personal targets allow you to practice in your backyard with ease. 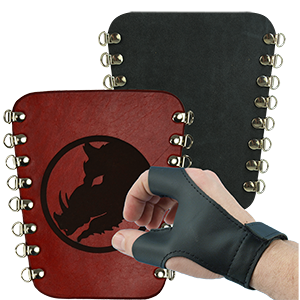 This makes both targets and arm guards a pair of must-have accessories for any archer to own. For those seeking knowledge, a few good books and DVDs might be just what you need to take your archery to the next level, either with a new shooting technique, new insight into the history of archery, or the skills necessary to make your own bows and arrows! And for those who seek to do medieval reenactments as an archer, we also offer a selection that is filled with items to help you on that front, making sure that you fully look the part! Whether archery is a casual hobby or a lifetime passion for you matters not, as the selection of archery accessories here at Medieval Archery contains a veritable plethora of items, all but ensuring that there is something here for everyone. Put yourself in this position - you nock your arrow, draw back your bow, and fire. The string grazes your arm and worse yet, messes with the alignment of your arrow, putting it several inches off-target. Medieval Archery brings to you a selection of arm guards and gloves that are perfect for keeping you safe, ensuring that when incidents like the above do happen, they do not leave you with welts or bruises to remember them by. A good bracer or arm guard is a must for the serious traditional archer as it is lightweight and easy to wear while offering a solid level of protection that cannot be beaten. Add in that it does not interfere with your shot and it becomes a win-win as far as archery equipment goes. And since several of our archery arm guards are emblazoned with heraldic emblems and impressive designs, they also go a long way towards enhancing your personal style too! We also carry archer hand protection in the form of supple leather gloves and finger guards that help to keep your digits safe and secure. For hand crafted protection that not only keeps you safe but also sets you apart as an archer, nothing compares to the variety and the quality that you can get from the arm guards and gloves found here at Medieval Archery. For some, archery does not end with the bow, the arrow, and the target. For some, it is about the age-old technique and the history that goes in to it. For some, it is about reenactment. 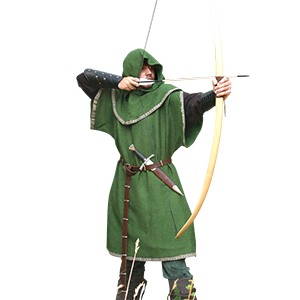 And for those who want to involve themselves with archery in medieval reenactment - or reenactment in general - Medieval Archery offers a selection of reenactment accessories that are perfect for putting together an authentic and historic ensemble. We offer authentic looking clothing for both men and women to wear to create their ideal archer look. We do not stop at clothing though, as we also offer belts, pouches, and other accessories that help to complete your look, as well as select pieces of armor including leather, mail, and even plate that would serve well any archer who wears it. And since it is best to always be prepared, we also carry swords and daggers as melee weapons and shields for defense, so that should your enemy close with you, you can abandon your bow (temporarily of course) and deal with your foes at close range! At Medieval Archery, we have tried to think of everything so that when you decide to do some historic archery reenactment, you can get all you need including your various reenactment accessories, right here in one easy experience.